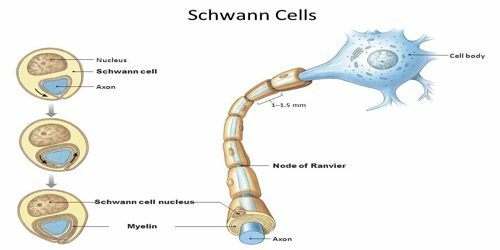 Schwann cell is any of the cells that cover the axons in the peripheral nervous system and form the myelin sheath. It is also called neurilemma cell. Schwann cells are named after German physiologist Theodor Schwann, who discovered them in the 19th century. These cells are equivalent to a type of neuroglia called oligodendrocytes, which occur in the central nervous system. There are two types of Schwann cell, myelinating and nonmyelinating. Myelinating Schwann cells wrap around axons of motor and sensory neurons to form the myelin sheath. The Schwann cell promoter is present in the downstream region of the human dystrophin gene that gives shortened transcript that are again synthesized in a tissue specific manner. 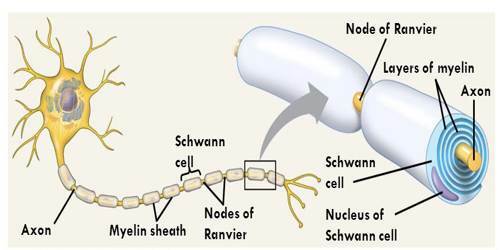 Schwann cells are involved in many important aspects of peripheral nerve biology, the conduction of nervous impulses along axons, nerve development and regeneration, trophic support for neurons, production of the nerve extracellular matrix, modulation of neuromuscular synaptic activity, and presentation of antigens to T-lymphocytes. The myelin sheath is created by Schwann cells in the PNS, and in the CNS, the myelin sheath is made by oligodendrocytes. The sheath is not continuous. Individual myelinating Schwann cells cover about 100 micrometres of an axon equating to approximately 10,000 Schwann cells along a 1-metre length of the axon. 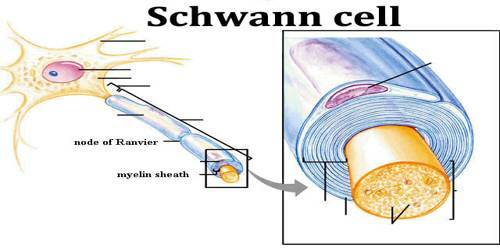 A well-developed Schwann cell is shaped like a rolled-up sheet of paper, with layers of myelin in between each coil. The inner layers of the wrapping, which are predominantly membrane material, form the myelin sheath while the outermost layer of nucleated cytoplasm forms the neurilemma. Schwann cells are essential for the maintenance of healthy axons. Schwann cell transplants in combination with other therapies such as Chondroitinase ABC have also been shown to be effective in functional recovery from spinal cord injury.